Strange, anachronistic beings – misfits in the contemporary world – feature in the new Penguin Modern Classics publication Ha Ha Hu Hu, which collects two novellas by the renowned Telugu writer Viswanadha Satyanarayana. In the first story, “Ha Ha Hu Hu”, Londoners find a wounded, unconscious creature with a horse’s head and a human body in their city. (The story’s sub-head is “A Horse-Headed God in Trafalgar Square”.) When it shows a deep intelligence – unlike any they have encountered before – they don’t know how to deal with it, or how to explain the rules of their own civilization (beyond caging it and demonstrating for its benefit that their guns can kill). Even a Sanskrit scholar, who realizes this might be a gandharva fallen to earth, is puzzled. In the second story, “Vishnu Sharma Learns English”, the scholar Vishnu Sharma – who is believed to have written the Panchatantra – and the 13th century poet Tikanna (who translated the Mahabharata into Telugu) appear first in dream form, and later as flesh-and-blood humans, to a lecturer, requesting that he teach them English. The king of the Gods, Indra himself, has asked them to return to earth to do this, so they can “get the education suitable for these days”. But the lessons that follow prove confusing to both the students and their master. 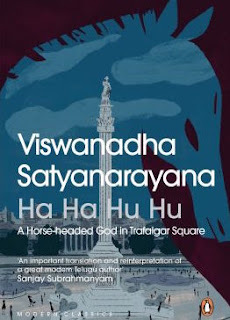 “Ha Ha Hu Hu” was first published in 1932, while “Vishnu Sharma Inglishu Chaduvu” came nearly 30 years later; these two English translations are by Velcheru Narayana Rao, who also provides an Introduction and Afterword. Many readers prefer to skip such essays and go to the stories directly, letting them speak for themselves. Personally, as someone who had never read Viswanadha Satyanarayana before, I found it useful to go through Rao’s pieces for context. That last analogy is intriguing, given that “Ha Ha Hu Hu” is about a beast that people don’t know what to make of – a cerebral, category-defying animal whose very existence seems to contradict everything one thinks one knows. The interactions between the horse-man and those who want to study him make up the bulk of the story: Ha Hu gets the better of the scientists and scholars who are smug about their knowledge and try to compartmentalize him in terms of their narrow experience – but he says equally smug and reductive-sounding things at times. (“Knowledge comes through tapas, not by cutting up animal bodies”.) 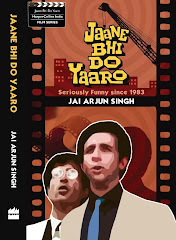 The story loads the dice in favour of the gandharva, and a reader can feel ambivalent about this, given the constant attempts – even in 21st century India – to haul us back into a supposedly golden age where everything was pristine, uncorrupted by newfangled ideologies or scientific progress. But this also works well for the novella, giving it a stream-of-consciousness quality and a dream-logic suited to its premise. At one point, the lecturer frets about the rules of etiquette in dealing with his spectral visitors. (He should get up from his bed to offer them water – but if he does that, he will wake up and they will be gone!) There are passages that are droll and poignant at the same time, such as the one where Tikanna mentions that he went to see a river he remembered from his own time, but couldn’t recognize it because someone had put “a belt” on her. However, Rao also suggests – and I think this is borne out by the story – that “Vishnu Sharma Learns English” shouldn’t be reduced to the message: Telugu or Sanskrit are superior to English. An important part of the point is that people like the lecturer inhabit an in-between world, where they have not fully understood or absorbed either the old or the new, and where they are thus susceptible to the bullying of those who insist that their way is the only correct one. “Viva twentieth century!” the lecturer cries in triumph during one conversation, where he seems to have temporarily silenced his visitors with his arguments. This sort of thing can come across as obvious, heavy-handed satire – but then, such is the nature of this material, and such must have been Satyanarayana’s position as a writer expressing his reservations with modernity even while grudgingly accepting some of its assumptions.